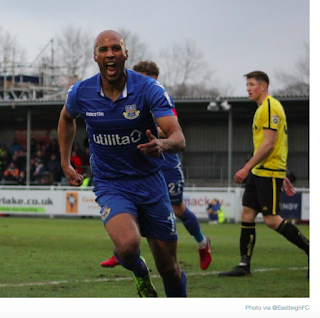 A Chris Zebroski hattrick fired Eastleigh to victory in a seven-goal thriller at the Silverlake Stadium. The Spitfires came from behind twice and made it four wins on the bounce. Andy Hessenthaler's side are now unbeaten in eight games. 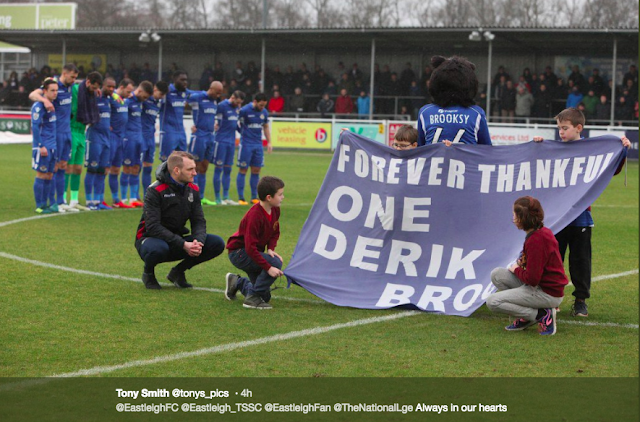 A fitting way to pay tribute to club founder Derik Brooks who sadly passed away this week aged 94. Eastleigh: Ross Flitney, Gavin Hoyte, Sam Wood, Sam Togwell (Danny Hollands, 84), Ayo Obileye, Andrew Boyce, Mark Yeates (Ryan Broom, 83), Cav Miley, Ben Williamson (James Constable, 74), Chris Zebroski, Sam Matthews. Subs: Ryan Cresswell, Frazer Shaw. Andy Hessenthaler on hattrick hero Zebroski: “He was man-of-the-match by a country mile. He didn’t stop running all game. Where he gets his energy from, I don’t know, but it’s fantastic for us. “Again, I’m disappointed with the goals we’ve given away, but we look such a threat going forward. Eastleigh continued their recent run of good form to come from 2-1 behind to win 3-2. 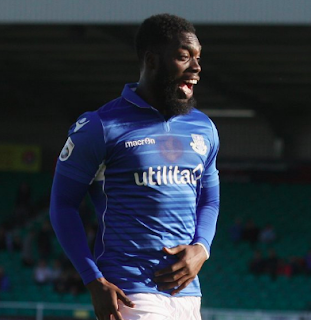 Ayo Obileye scored twice for the Spitfires and Ryan Broom netted on his debut to make it seven games unbeaten for Andy Hessenthaler's side. Here's what the Eastleigh manager had to say reflecting on the win: “I don’t think we played particularly well today, but you’ve got to give Maidstone credit, they’re a good footballing team. “We gave them two goals first half. "For the first one, the ball went out of play, but it doesn’t matter about that. Ayo’s held his hands up, you can’t give a ball back to Rosco (Flitney) like that and you can’t start games like that. “Are we going to get a clean sheet this season? I’m not so sure. “But if we keep winning games 3-2 and 4-3, I’ll take it all day long! “We’re on a bit of a roll now and we’ll take full confidence to play Hartlepool at home on Saturday. “If we keep doing that week in, week out until the end of the season, who knows? Eastleigh secured back-to-back wins with a 2-1 win at Torquay to make it six games unbeaten. Ross Flitney saved a penalty late in the game to help preserve victory after goals from Sam Matthews and Gavin Hoyte for the Spitfires. Eastleigh made it 8 points from 12 under new manager Andy Hessenthaler. The Spitfires triumphed in a pulsating game at the Silverlake winning 4-2 against Guiseley. The Spitfires goals came from Cav Miley, Chris Zebroski, Mark Yeates and Callum Howe. Eastleigh: Ross Flitney, Gavin Hoyte, Sam Wood, Danny Hollands, Andrew Boyce (Ayo Obileye, 32), Callum Howe, Bradley Hudson-Odoi (James Constable, 70), Cav Miley, Chris Zebroski, Mark Yeates, Sam Matthews (Sam Togwell, 84). Subs (not used): Craig McAllister, Frazer Shaw.